Many conference centers and hotels charge an exorbitant amount for their coffee service. Paying $90 a gallon for regular drip coffee is far too much. 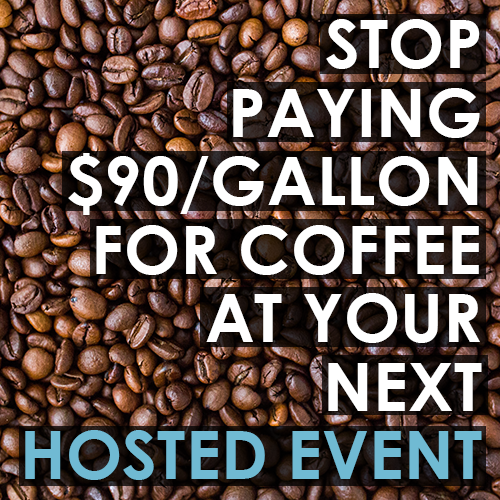 Plus, why waste time trying to calculate the exact amount of coffee you think your guests will consume? We'll have the coffee ready and waiting for your guests upon arrival. And, unlike other venues, we won't stop beverage services after the first round! Don't forget - you can save a bunch on your catering choices as well. Give us a call today to see how we can help you host your next business event, meeting, training or management retreat. P.S. - Don’t forget the free 150 mbps Wi-Fi that is available to you and all of your guests in attendance!